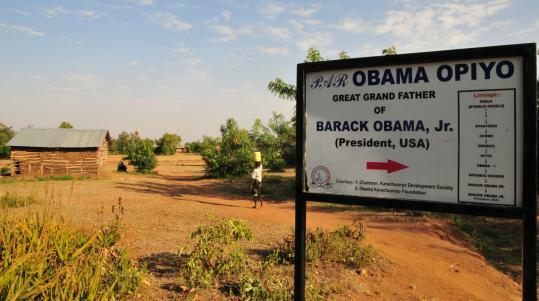 KOGELO, Kenya - After Barack Obama was elected to the US Senate in 2004, a delegation from the remote African village where his father was raised journeyed to Washington, seeking financial help. But Obama offered them advice, not money. Now that Obama has moved to the White House, expectations of financial benefit have grown even greater in this tiny hamlet where water is still delivered to thatched huts on the backs of donkeys. “There are still those who are waiting for him to send millions,’’ said Nicholas Rajula, a Kogelo businessman. Dreams alone seem to be sustaining those counting on an economic boom in this rural corner of western Kenya, near Lake Victoria, where the American president’s father - also named Barack Obama - grew up and where many of his relatives remain. In Kogelo, the village where Barack Sr. was raised, there is no restaurant or post office to speak of. Two hours from the nearest city, it is not on most maps. Still, the price of land here has skyrocketed because of rampant speculation about an Obama family museum that the Kenyan Ministry of Tour ism has promised to build. And there have been some modest, but tangible, signs of progress that seem tied to the village’s new notoriety. Within a week of Obama’s election victory last year, the government began to pave the main road to town. It also brought in an electricity and water lines to Obama’s step-grandmother’s compound. Some relatives have also set up foundations, trying to raise money for development projects using the Obama name. And strangers are suddenly a common sight in the market, attracted by safari companies that advertise heritage tours about the first African-American US president. A tourist hotel is planned. But what is missing is a direct infusion of cash from Obama or the US government, say local residents and members of the extended Obama family, some of whom say they have relayed funding requests through e-mails and letters to Washington. That expectation might come as a surprise in the United States, where such gifts are not an obligation and Obama is not considered a particularly wealthy man. But in Kenya, where politicians are often judged by how much financial help they funnel to family and tribe, the lack of cash donations from the president has caused some consternation. Rajula, the Kogelo businessman who funded the delegation’s trip to Washington in 2005, said Obama encouraged the group - which included his own uncle - to form self-help organizations and apply for funding through official channels, such as USAID. “There is no money that comes from his pocket,’’ Rajula said. A White House official said: “The president’s policy of pointing aid requests to official channels is consistent with his message of good governance’’ in Africa. USAID press officer Harry Edwards said the agency gives no special consideration to Obama’s family members or organizations hailing from his family’s home area. Still, relatives in Kenya believe that Obama’s presidency will bring development, one way or another, so much so that two villages are competing to claim his ancestral roots: Kogelo, the place his father grew up and is buried, and Kobama, a village about 100 miles away where the president’s great-grandfather settled and where the majority of his estimated three hundred relatives remain. In Kobama, which literally means “land of Obama,’’ family members have fixed up his great-grandfather’s grave, erected a signpost outlining his lineage, and gladly receive a steady stream of curious visitors. Now, they too, are angling to put up a museum near the mud house where President Obama slept when he visited as a young man. Charles Oluoch, a second cousin of the president who chairs a new family foundation seeking development funds, said Obama’s Harvard-educated father helped the boys of Kobama with jobs and school fees. “Now we expect the president to take over,’’ he said. But he added that he understands Obama has higher priorities. “This man is USA material and he has to fulfill all his campaign promises,’’ he said. Obama was raised by his Kansas-born mother, and only met his Kenyan father once. But he tracked down a sprawling family in Kenya after his father’s 1982 death, while researching his autobiography, Dreams from my Father. In the book, Obama grappled with the idea of Western guilt, questioning how much he could help the huge extended family he was meeting for the first time. “Now I had responsibilities,’’ Obama wrote in 1995. Obama returned to Kogelo a few years later, to introduce his fiancee, Michelle, and in 2005, to give a speech as senator. But his Kenyan family members pose a unique challenge for the US president, culturally and politically. At least six presidents had an immigrant parent (both of Andrew Jackson’s Scotch-Irish parents were immigrants), but no president in modern US history has had so many blood relations living without running water or electricity overseas, said Rick Shenkman, history professor at George Mason University. “He was the rags to riches candidate,’’ he said. Some of Obama’s relatives, including his half-sister, with whom he is close, live middle-class lives in Kenya and abroad. But others are struggling. “We lack clean water, electricity,’’ Oluoch said. In recent months, Obama’s relatives have formed at least three family foundations to promote development in these rural homesteads. Leaders of two of the foundations said they intended to send funding proposals directly to the president. The Kobama Foundation, chaired by Oluoch, meets once a month to raise money to build a tourist site near Obama’s great-grand-father’s grave. The group also wants funding for an irrigation project. Other relatives have started the Obama Karachuonyo Foundation, which is trying to raise $2 million to promote education, farming assistance and tourism in the area. A third family foundation, the Barack H. Obama Foundation, set up by Obama’s half-brother to memorialize their father, has also been soliciting international donations for community development projects. Kogelo’s secondary school, a series of dusty classrooms built on land that Obama’s grandfather donated decades ago, closed several times for lack of funding. It was renamed the Senator Obama Kogelo Secondary School in 2005, with Obama’s permission, in the hope that his fame would attract donations. For years, little came of it. Obama visited it as senator, but never promised to raise funds for it, school officials said. But since Obama has become president, private donations from strangers have flooded in: solar panels from Greenpeace, laptops from the city of Obama in Japan, and school sponsorships from American travelers who have made their way to the village. “They just came because of President Barack,’’ said Yuanita Obiero, the headmistress. Obiero, who was invited to attend the inauguration in Washington, D.C., with the official delegation from Kogelo, was given $35,000 raised during an inaugural ball. She used the money to begin building new classrooms, but still needs more funding to complete them. USAID has so far turned her down. So now Obiero, like many in this tiny town, is unsure what the future holds. “People have high expectations that there will be a lot of changes, but the things which can happen, we can’t tell,’’ she said. On a recent afternoon, Sarah Obama, 87, sat in a semicircle of chairs in the yard, as cows and chickens meandered nearby. Each day, she greets about 100 visitors. Most are locals, but a few have traveled from distant parts of the globe. The deluge of visitors have prompted her to build a modern flush toilet for “important guests’’ and to set up a curio shop at her front gate, where her business partner, Flora Akinyi, sells hand-made beads and baskets to the visitors. Akinyi says her share of the money helps her put her three children through school. But Rajula, the businessman, said he has learned it is unrealistic to expect a sudden infusion of money from America. During the 2005 trip to Washington, Rajula told Obama about the large number of orphans in Kogelo, so Obama encouraged him to set up an orphanage. But when Rajula sent fund-raising appeals through an Obama aide, he was told to approach funding agencies through ordinary channels. Rajula said he understood Obama’s reluctance to get directly involved in projects that had no track record. Senator Obama continued to exchange e-mails with him, Rajula said, but now all his e-mails to Obama bounce back. Now Rajula has began investing in another plan: a tourist hotel in Kogelo.